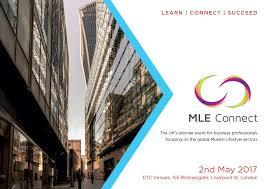 The organisers of MLE Connect recently put together a great day of Muslim business networking in London on 2nd May. Food, fashion, finance and more, with informed and lively panel sessions and presentations in a great central London venue, this was a day of opportunity for all who attended. Anyone who may have doubts about the significance of the Islamic Economy for the UK needs to spend a day in the company of some of the 200 delegates in attendance. This is not a passing fad: when you look at the numbers, you recognise that this is a very big niche that is growing in size, scope and value. In the light…or should we say the murk…of the Brexit, as the UK wants be “open for business with the rest of the world”, the Muslim lifestyle markets offer vigorous growth both at home and overseas. 30% of the Muslim population (at home and globally) is under the age of 15; 60% are under 30, and the overall population is growing at twice the rate of other religious communities (according to Pew research). That should underline the relevance that this demographic are going to have in the near future when around one in every three people is of the Muslim faith. For anyone in business who is not paying attention to this emerging market paradigm…then they had better get in line behind everyone else who is. And take note, there is a crop of young, savvy Muslim entrepreneurs who are taking hold of this opportunity with both hands and hearts, and they are a force to be admired and reckoned with…and supported. At MLE Connect, it felt like a change of season, a kind of entrepreneurial springtime, with ideas, apps, start-ups all bursting with life and growth. This emerging sector is a valuable asset to the UK economy whose real value is about to become evident – and whose ethical, moral and spiritual values are urgently needed in a global economy dominated by usury, greed and a glaring lack of basic human morality. One outcome of the day’s discussions was the idea of a British Muslim Trade Association to support all those businesses that are engaged with the Muslim lifestyle markets. For more on this topic, and to have your say on what benefits this Association should offer, please follow the link to a short survey, and put your opinion into the mix. There is a change coming, and you can feel it in the air. As I always say, you can’t make the waves, but if you want to go surfing, you better take advantage of them when they happen. And you can’t catch a wave sitting on the beach; you have to be in the water, on your board. And from where I am looking…Surf’s Up!